New Delhi : India and the UK discussed on Wednesday the possibility of a new trade pact as Britain aims to build on its bilateral business ties post its exit from the 27-nation European Union. As Britain’s top financial policymakers began a two-dayvisit to India, a free trade agreement (FTA) figured duringtalks at the 9th UK-India Economic and Financial Dialogue. UK Finance Minister Philip Hammond, Business Secretary Greg Clark, Bank of England Governor Mark Carney and Financial Conduct Authority (FCA) CEO Andrew Bailey are visiting the national capital on Wednesday and Mumbai on Thursday to boost trade ties with the world’s fastest growing major economy. While Britain, which is attempting to establish itself as “a truly global” player after Brexit, pitched for increased trade engagement with India, New Delhi said a formal dialogue on possible bilateral trade agreement can start only after the completion of UK’s exit from EU that may take up to two years. After talks, Indian Finance Minister Arun Jaitley said India in its communication with the UK government has stated that post Brexit it will look for more open trade, and moretrade arrangements. “Obviously this can be formally discussed after the Brexit takes place but it is probably going to imply a farwider and a far higher engagement between the two countries. “What shape it is going to take can only be formalised post Brexit negotiation,” he told a joint press briefing. Jaitley further said India is open to all arrangementswhich are in mutual interest for expanding trade onceopportunities arise after Brexit. “India as you have seen has been opening up. We areopening up in terms of nature of investment in India, we areopening in terms of our trade. I am quite certain that arrangements which are mutually beneficial to both theeconomies would be arrived at (after the Brexit),” he said. Hammond said the two nations have very significant trade and investment relationship and Britain is the largest G20 investor in India in the last 10 years, while India is the 3rd largest investor in the UK. “We have continued to consolidate past success andidentify new areas where we can work together over the nextcouple of years, preparing for the point where Britain leaves the EU and is able to engage with Indian colleagues in a deep discussion about a future FTA between the UK and India,” he said. Noting that this a mature relationship between the equals– the largest democracy in the world and the oldest democracyin the world, Hammond said “both of us see opportunities and opportunities of course based on commonalities; we share legal system, we share language of business which gives us huge advantages in trying to build trade and investment links between our countries”. India is a major investor in the UK economy just as the UK is the major investor in the Indian economy, he said. On masala bond, he said, there are more issues coming and more and more Indian entities will come and raise from London. Stating that both countries had a “very successful dialogue”, Jaitley said the next one or two years are going to be momentous because of the changes taking place in both the economies. “The UK, post Brexit, is looking at a different kind of relationship with India and there is a huge aspiration in India itself also to add to and improve upon that relationship. 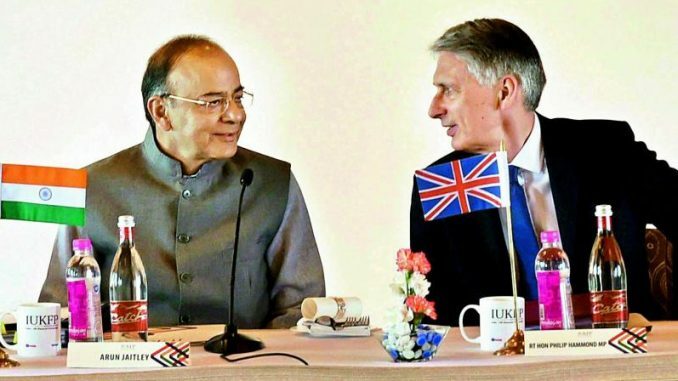 The 10th and 11th round of this dialogue will take this to an entirely different level,” Jaitley said.The UK is among India’s major trading partners and in 2014-15, it ranked 18th in the list of India’s top 25 trading partners. Since 2000, Britain has invested more than 19 billion pounds (USD 24 billion) in India. As per the Department of Commerce data, two-way merchandise trade during 2014-15 was USD 14.33 billion, marking a decrease of 9.39 per cent as compared to 2013-14.